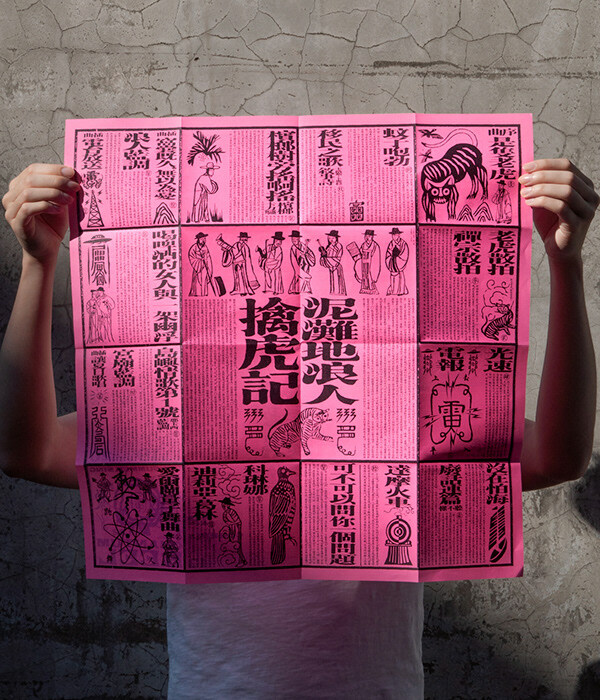 To convey the experimental nature of the music and its subject matter, which plays with the East/West cultural divide, we decided to create a visual style that combines Taiwan's religious folk culture and Taoist mysticism with a touch of 50’s retro-futurism from the West. 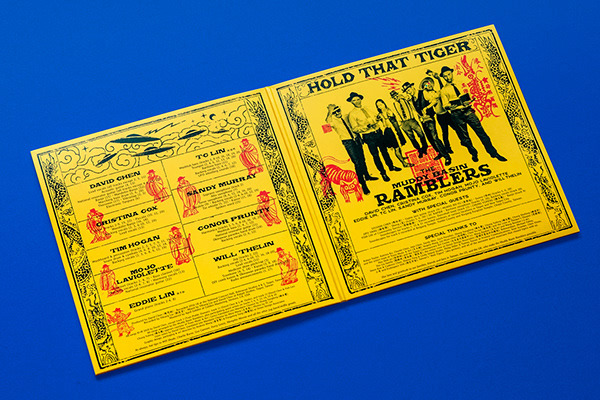 The title “Hold that Tiger” comes from a lyric in "Tiger Rag", a jazz standard dating back to 1917, which is the first song on this album. 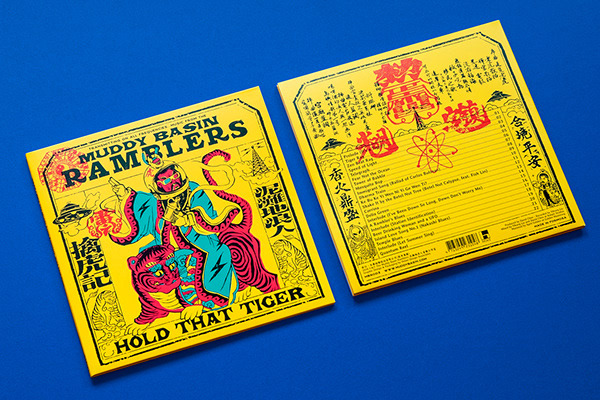 We borrowed from traditional Chinese folk art, invoking an iconic image of the Taoist figure Zhang Daoling, aka "Chinese Celestial Master Zhang Tianshi" (張天師神符), who is often portrayed with a tiger. 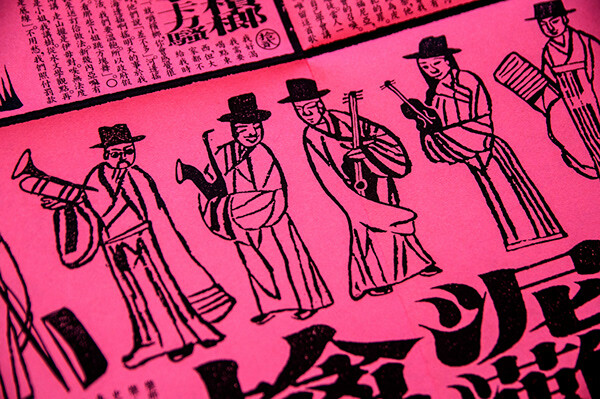 The image is sourced from a Taoist paper talisman ("Fu"/符). 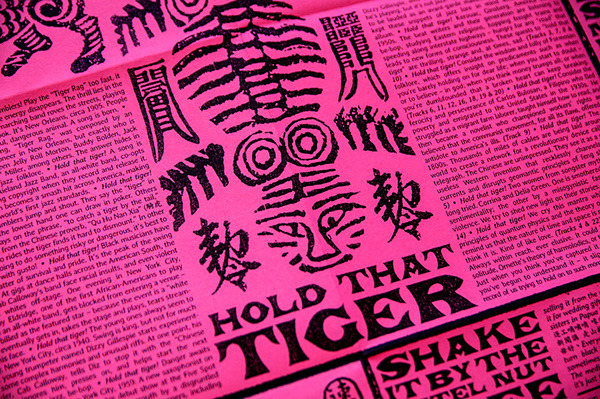 The Fu talisman is traditionally kept to ward off evil or unwanted spirits and ghosts. 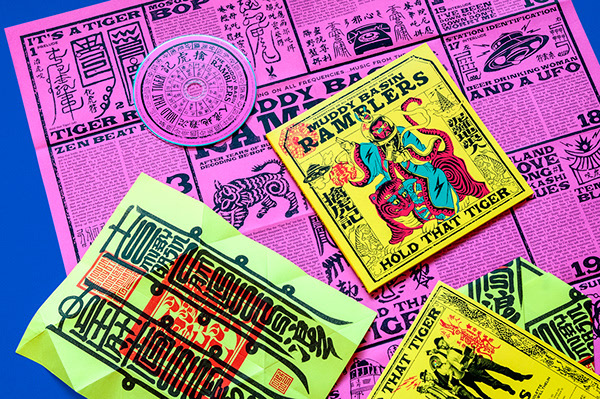 In keeping with one theme on the album -- the mixing of traditional and modern elements -- we "retro-fitted" Master Zhang with a space helmet, 3D glasses and a jug (often used as a homemade "tuba" by jug bands). 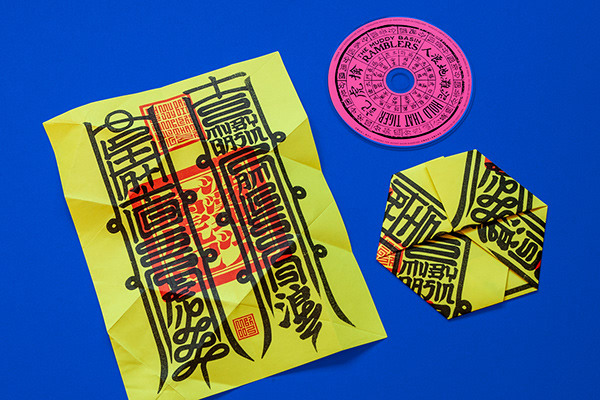 The lyrics and liner notes are printed in both English and Chinese, with the latter accompanied by symbols representing Taoist magical spells, which were originally found on Fu talismans. 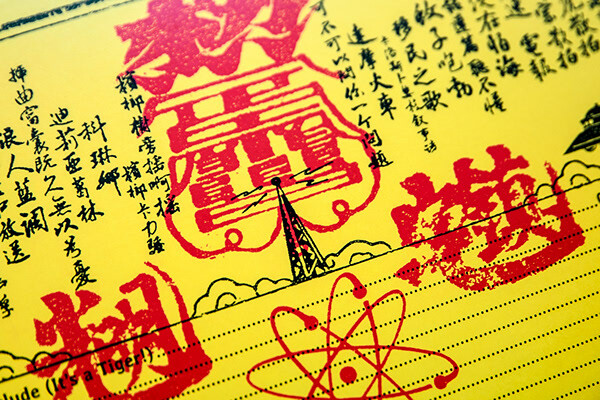 These symbols were sourced from esoteric texts akin to a Chinese "grimoire," which date back thousands of years. 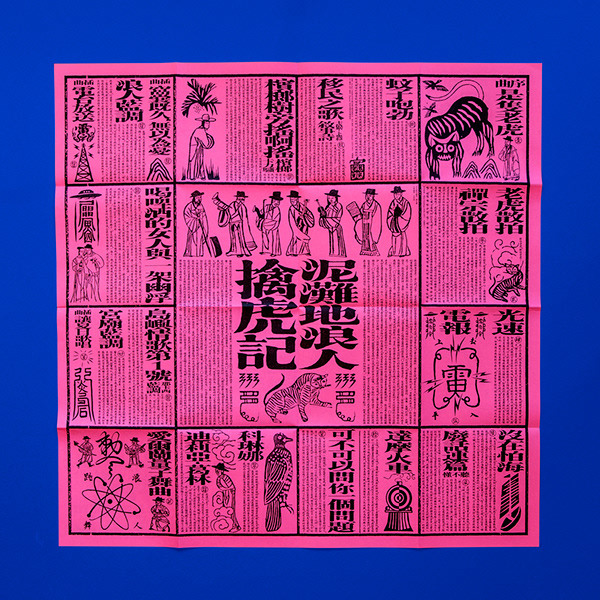 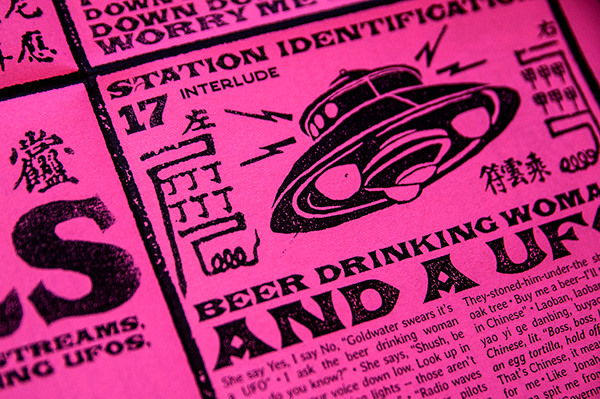 The grid layout for the lyrics was inspired by the standard chart form used in Purple Star Astrology (Zi Wei Dou Shu / 紫微斗數), a common form of Chinese fortune-telling with Taoist roots that dates back to the Tang Dynasty (during the years 618-907). 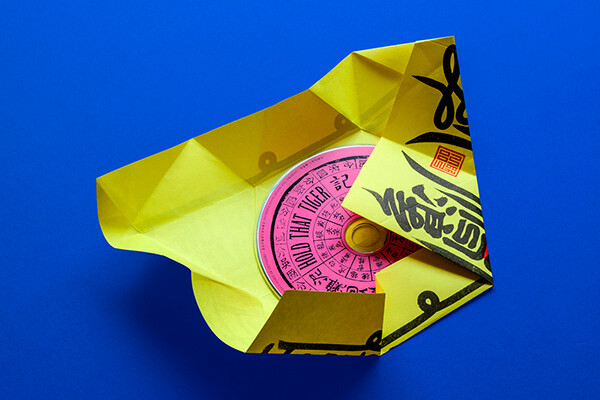 The CD is wrapped in a sheet of yellow paper that takes on the appearance of a Taoist Fu talisman. 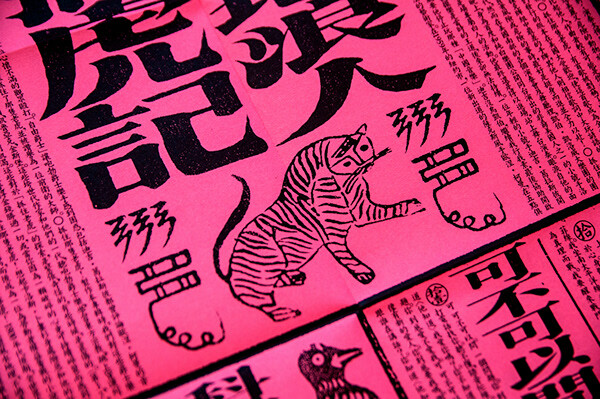 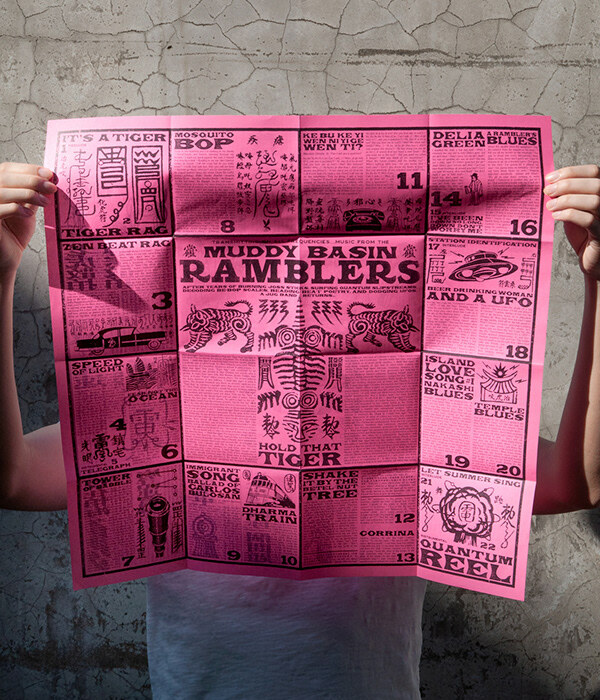 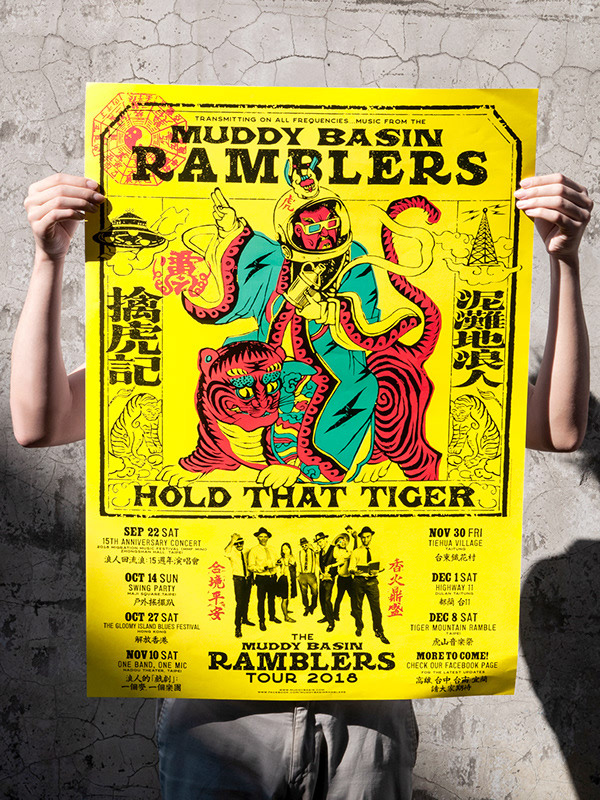 The printed calligraphy may look like abstracted Chinese glyphs, but is actually comprised of Roman letters, with the band's name written on the right (The Muddy Basin Ramblers) and the title of the CD on the left (Hold That Tiger). 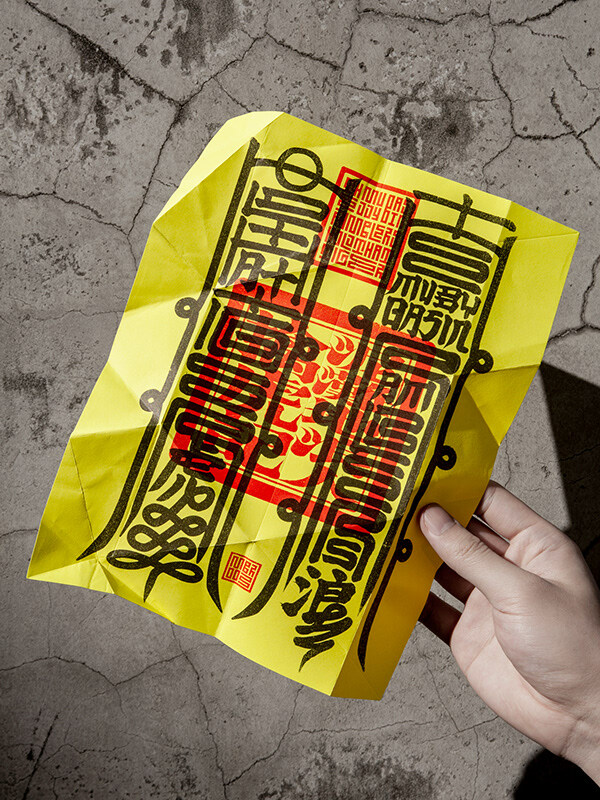 This reconstruction technique is borrowed from artist Xu Bing's "square word calligraphy," in which he devised a system for writing English in a form that resembled Chinese characters. 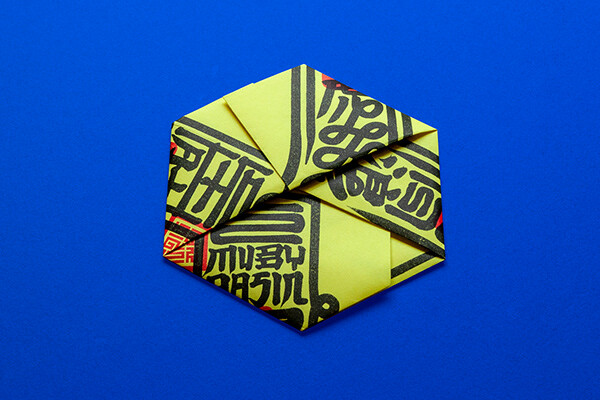 When folded using a origami hexagon folding technique, the CD sleeve emulates the appearance of a traditional Taiwanese amulet. 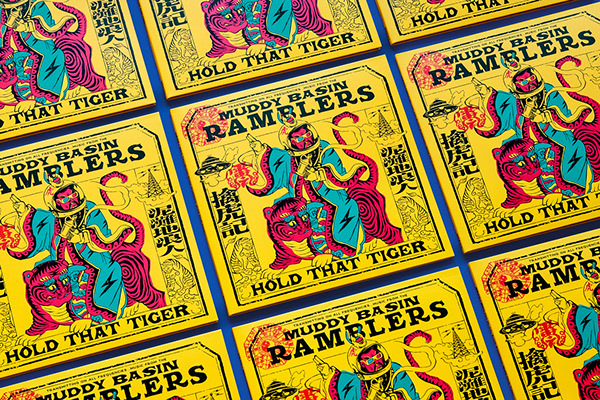 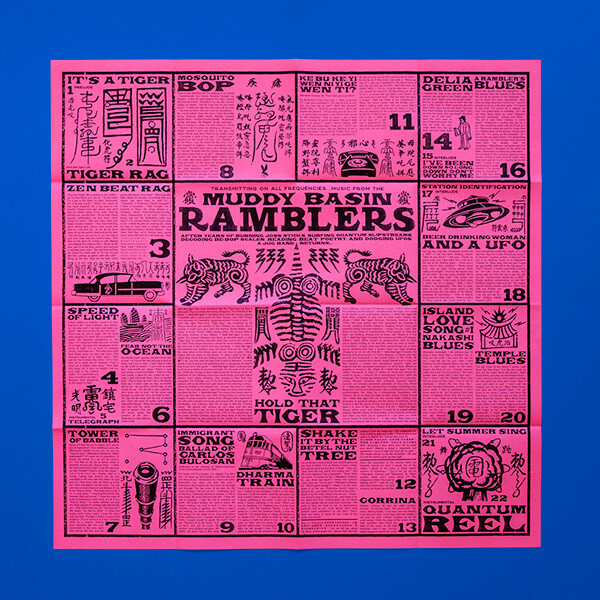 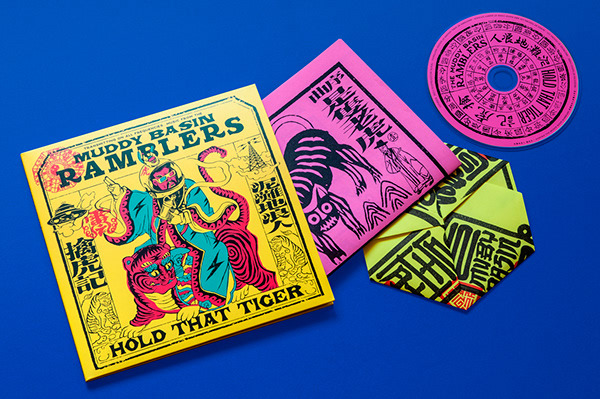 “Hold That Tiger” is the second full length album of Taiwanese jug band “The Muddy basin Ramblers”. 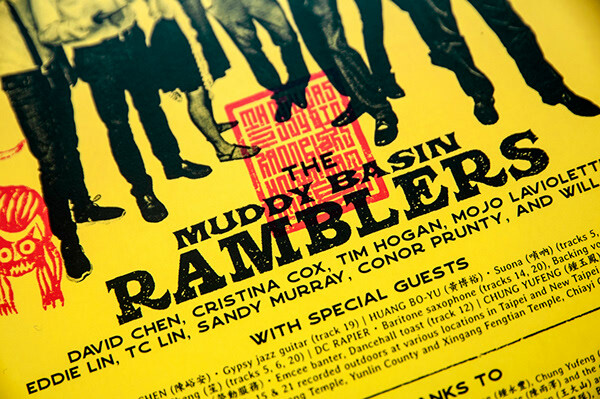 It contains 22 new songs with a mixture of music genres such as jazz, blues, Swing, Ragtime, and blended with Taiwanese traditional temple parade music, Nakasi, Irish drinking song and even Taiwanese rap. 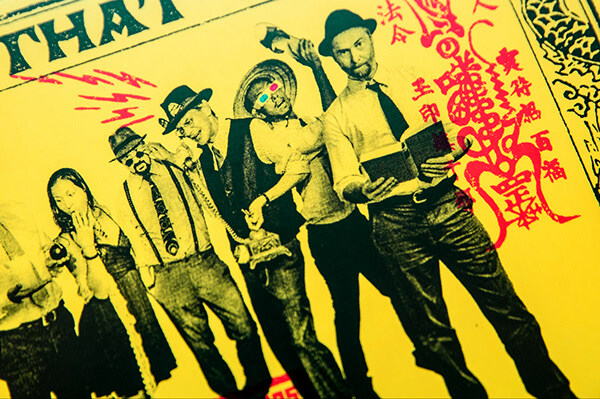 with a great variety of subject matters includes religious culture, history of immigrants, Sci-Fi movies from the 50’s, the Beat Generation, History of jazz music, religious cult and even UFO…To reflects the experimental surreal nature of the music and subject matters about the East and the West, we decided to create a visual style that combines the Eastern mystical temple culture with a touch of 50’s retro-futurism of the the west.